You're going to love the new Ford Ranger. Ford has finally brought back its midsize pickup truck and it has more technology than ever. You can check it out at Mullinax Ford of Kissimmee. One of the first things you'll notice is an 8-inch infotainment screen. This is connected with voice-activated SYNC 3 and FordPass Connect. You're able to connect your smartphone to take advantage of more apps, allowing you to get turn-by-turn directions, music from a variety of streaming sources, and more. Plus, the Bang & Olufsen sound system is sure to impress. Other technology is in the form of safety features. 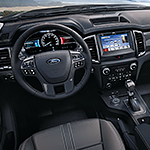 The Ranger has Ford Co-Pilot 360, which includes a number of driver-assist technologies. You're able to be safer on the roads with blind spot monitoring, lane-keep alerts, forward collision alerts, a rearview camera, and various other sensors that will tell you what's happening in traffic.